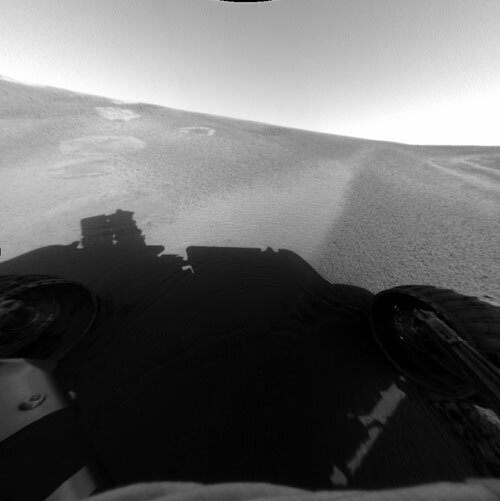 This image from the Mars Exploration Rover Opportunity's front hazard-avoidance camera shows the rover at its Sol 53 (March 17, 2004) location within the "Eagle Crater" landing site. Dubbed “Neopolitan,” this location has three different soil patches: a very light unit, a dark unit, and an airbag bounce mark. Scientists are imaging each of these units as part of a crater soil survey. They hope to better understand the origin of the soils they see in the crater and the relationship of the soils to the rocks in Opportunity ledge. This image was taken on sol 52 of Opportunity’s journey (March 16, 2004).